We’ve been back from California for about a week and I’m still feeling a little loopy. In the last month, we’ve been on 4 flights (actually doesn’t seem like a lot now that I type it out), but it sure feels like it wrecked havoc on our routine or whatever one I can have with a 9 month old. We decided the last minute to (re)book the trip to Southern California for the sun and warmth. We were able to get fairly inexpensive flights and found an Airbnb (our first time) in a great location. 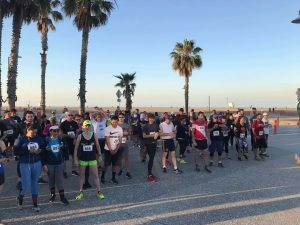 I had decided to not sign up for another marathon and when I learned about A Better World Running and The Outstanding Half Marathon in Santa Monica, it seemed like a lot of fun. 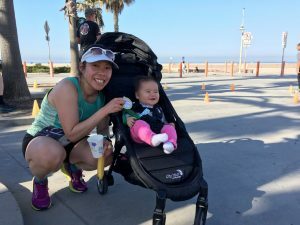 A low-key, really casual race along Santa Monica State Beach – perfect! The race was the day after we arrived and between tired legs and jet lag, I had serious thoughts about downgrading to the 10K or 15K but am glad I stuck with the half. The start and finish line at Crescent Bay Park was an easy Uber ride from where we were staying (though if I had planned my morning better, I could have easily run the mile there). The race is measured in clock time so in type-A fashion, I was super anxious about making sure I got there in time. Bib pick up was easy and there was also in-person registration available that day. A race that doesn’t sell out months in advance, wow, very different from the NYRR experience at home. I pinned on my bib, dropped my bag off behind the registration table, and stretched out a little all and then we were off. 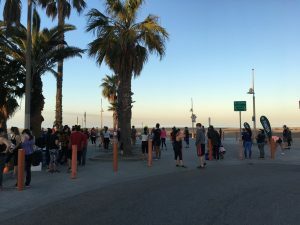 The course goes along the different beach paths on Santa Monica State Beach. There is chalk marking the turns for the 5K, 10K, 15K, and half. The half marathon goes a little over 2 miles north and then turns back around. You run the out and back loop 3 times. I’m not generally a fan of out and backs but this one wasn’t so bad. 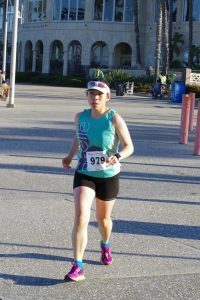 I enjoyed the flat course, knowing about how much distance I had left before turning around, and seeing others on the course at various points in their race. All of the runners and organizers were super nice. The runners cheered each other on during the course (a benefit of an out and back), which is also very different from what I am used to with the crowded NYC runs. The water and fuel station was at the start and finish line, so it was only available 2 times for the half. I hadn’t really thought too much about whether this would be an issue for my hydration and as I watched others on the course with their own water bottles, I probably should have carried one as well. The temperatures were in the low 60s at the start but by the time I finished it was well into the 70s. Parts of the course were shaded and there was a nice breeze from the Pacific Ocean but it was still hot (especially in comparison to home) and I was a sweaty mess. While this race was not a PR (and I wasn’t aiming for one nor am I in shape enough), I ran a very well executed race. The first mile was 9:59 and the 13th mile was the fastest at 9:10. I gradually ran around 10 seconds faster for the first 6 miles and from mile 7 on, ran at a very consistent pace ranging from 9:22 to 9:10. While I was feeling tired and my legs started to cramp a little towards the end, I knew Josh and Charlotte were waiting for me at the finish (thank you Forerunner 35 for the text notifications) so I was motivated to run faster. This was Charlotte’s first time spectating one of my races so it was extra special to see her at the finish. I even ran over to hug her right before the finish — I think she was confused who the sweaty weirdo was wearing a hat and sunglasses. My finish time was 2:04, a little less than a minute slower than my Central Park Half time in February. I have some work to do, if I want to get back to the fitness level I was at pre-baby but I am in no rush and just happy to be able to run these distances. Overall I had a great time running The Outstanding Half Marathon and really enjoyed my first casual race environment. 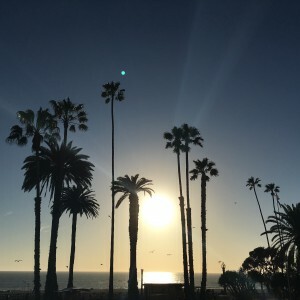 It’s also of course hard to not enjoy running along the beach and watching the sun rise along the Pacific Ocean. If I lived in the area, I would probably be running one of A Better World Running’s races every weekend! There’s something to be said about the weather and simplicity of a low-key race culture. 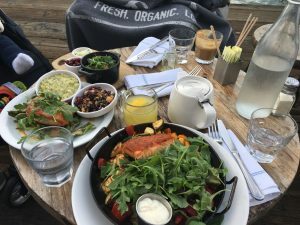 And oh, we had a great time eating our way through Santa Monica afterwards. 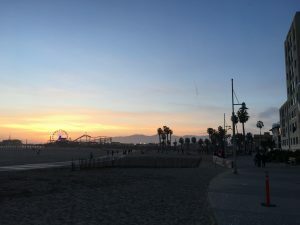 There were a lot of walks along 3rd Street Promenade, Tongva Park, the beach and Santa Monica Pier. 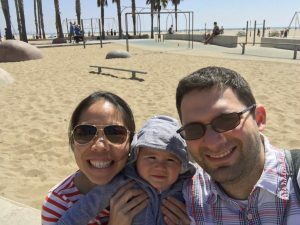 With a baby, our vacation was much more low-key but it was exactly what we were looking for.